Summary and Definition: The Iraq War was fought between Iraq, led by Saddam Hussein, and a coalition of forces led by the United States from March 20, 2003 to December 18, 2011. Conflict in Iraq erupted just weeks after the Gulf War (2 August 1990 – 28 February 1991) had ended. Iraq broke the peace terms, failing to comply with UN weapons inspectors and relinquish weapons of mass destruction and ballistic missiles. Saddam Hussein, the President of Iraq, refused to step down and in March 2003 US troops led the invasion of Iraq, in coalition with the UK and other nations. The Iraq War resulted in the execution of Saddam Hussein and the overthrow of his regime, followed by years of violent conflict with different groups competing for power in Iraq. The U.S. formally declared an end of Iraq War and its withdrawal in a ceremony in Baghdad in December 2011. George W Bush was the 43rd American President who served in office from January 20, 2001 to January 20, 2009. One of the important events during his presidency was the Iraq War. The Iraq War (March 20, 2003 to December 18, 2011) was to have two phases consisting of Invasion and Occupation. The first, brief invasion phase took place from March to April 2003 during which time U.S. and British troops invaded Iraq and swiftly defeated Saddam Hussein's Iraqi military forces. The second occupation phase of the war began in April 2003 in which US-led forces occupied Iraq and entered the long period of guerrilla warfare as the country descended into the “sectarian violence" of civil war. The second phase of the war focused on the on-going rebuilding process and the hunt for Saddam Hussein. Fast, fun facts and Frequently Asked Questions (FAQ's) about the Iraq War. When did the Iraq War start? The Iraq War started on March 20, 2003. It would last for 8 years, 8 months and 28 days ending on December 18, 2011.
Who was Saddam Hussein? Saddam Hussein (28 April 1937 – 30 December 2006) was the president of Iraq. He was a brutal dictator who implemented widespread, systematic violations of human rights and international humanitarian law. Who won the Iraq War? The US-led coalition succeeded in toppling the regime of Saddam Hussein but Iraq subsequently descended into Civil War and the US declared the end of the Iraq War on December 18, 2011. What are Weapons of Mass Destruction (WDMs)? Weapons of Mass Destruction (WDMs) are nuclear, biological and chemical weapons and long-range ballistic missiles. Saddam Hussein became President of Iraq and leader of the Arab Socialist Baath Party. Between 1980- 1988 he led the country in the Iran-Iraq War employing indiscriminate ballistic-missile attacks and the extensive use of chemical weapons. In 1990 Iraq invaded Kuwait sparking the Gulf War. In March 1988 Saddam Hussein had launched a large-scale chemical weapons attack against the Kurdish population in Iraq killing thousands of people. In addition, his military forces had attacked targets in Iran with combinations of mustard gas and nerve agents through the use of aerial bombs. During the Cold War (1945 - 1991) not many countries had WDM's and the US relied on a policy of deterrence to prevent the use of Weapons of Mass Destruction (WDM's). In the 1980's the policy of deterrence became unviable as countries began developing weapons of mass destruction and were actively sponsoring terrorism. The Bush administration believed that Iraq posed the most immediate threat from weapons of mass destruction when, following the Gulf War against Iraq (2 August 1990 – 28 February 1991), UN Weapons Inspectors had been tasked to seek evidence that Iraq, led by President Saddam Hussein, had developed biological weapons and had an advanced nuclear weapons development program. 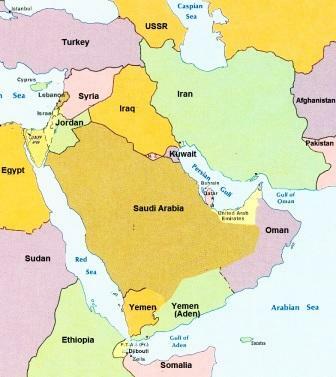 The peace terms of Gulf War included that Iraq relinquished all weapons of mass destruction and any ballistic missiles with ranges exceeding 90 miles (150 km). In April 1991 Iraq was subjected to weapons inspection program. In October 1998 Saddam Hussein ended cooperation with the United Nations (UN) Special Commission to Oversee the Destruction of Iraq's Weapons of Mass Destruction (Unscom). In December 1999 the UN Monitoring, Verification and Inspection Commission (Unmovic) was created to replace Unscom but Iraq rejected the UN resolution and refused to cooperate with weapons inspectors. In November 2002 the UN weapons inspectors returned to Iraq, backed by a UN resolution which threatens serious consequences if Iraq is in "material breach" of its terms. Saddam Hussein and Iraq were also believed to sponsor and support terrorist groups such as Al-Qaeda. In 1998 the leader of Al-Qaeda, Osama bin Laden, had declared that acquiring and using weapons of mass destruction was his Islamic duty and played integral part of his jihad. It was clear that Al Qaeda wanted to purchase or develop nuclear and biochemical weapons of mass destruction. On January 29, 2002, in his State of the Union Address, President George W. Bush used the term "Axis of Evil" to describe the governments of Iraq, Iran and North Korea that he accused of helping terrorism and seeking Weapons of Mass Destruction (WDM's) consisting of nuclear, biological and chemical weapons. 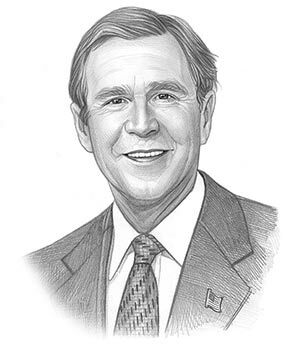 The following fact sheet contains interesting facts and information on Iraq War for kids. Iraq War Facts - 1: Iraq failed to fully cooperate with the UN weapons inspectors and on March 17, 2003 President George W. Bush issued an ultimatum demanding that President Saddam Hussein stepped down from power and leave Iraq within 48 hours, or face another war. Iraq War Facts - 2: Saddam Hussein refused to step down or cooperate with the weapons inspectors and on March 20, 2003 United States, Britain and allied forces launched an attack in Iraq to topple the Iraqi dictator and his regime and the Iraq War began. Iraq War Facts - 3: Invasion of Iraq: The coalition of American-led, British and allied forces launched cruise missiles from fighter-bombers and warships stationed in the Persian Gulf. Iraq War Facts - 4: The mission of the coalition, as described by U.S. President George W. Bush and British Prime Minister Tony Blair, was "to disarm Iraq of weapons of mass destruction, to end Saddam Hussein's support for terrorism, and to free the Iraqi people." Iraq War Facts - 5: President Bush addressed the American people stating that "At this hour, American and coalition forces are in the early stages of military operations to disarm Iraq, to free its people and to defend the world from grave danger". Iraq War Facts - 6: The invasion of Iraq, called 'Operation Iraqi Freedom', lasted from March 2003 to April 2003 as 200,000 coalition troops invaded the country. Iraq War Facts - 7: The invasion began with an an air strike on the Presidential Palace and ministries in Baghdad on 20 March 2003 as ground forces enter the country close to the Iraqi-Kuwaiti border in an incursion into Basra Province. Iraq War Facts - 8: The Battle of Basra, fought between the British 7th Armored Brigade (The Desert Rats) and Iraqi forces, lasted from March 21, 2003 to April 6, 2003 ‎and resulted in the British occupation of the city of Basra. Iraq War Facts - 9: American forces engaged in the Battle of Najaf (March 24, 2003 – April 4, 2003) and captured the city as the main body of coalition forces fought their way into the heart of Iraq and the capital of Baghdad. Iraq War Facts - 10: The Battle of Karbala, at a key approach to Baghdad, was fought by American troops from March 23 – April 6, 2003 against some of the best units of the Iraqi Republican Guard. The US victory at the Battle of Karbala enabled coalition troops to move onward to Baghdad. Iraq War Facts - 11: Three weeks into the invasion the intense Battle of Baghdad was fought between April 3–12, 2003. Several thousand Iraqi soldiers were killed in the battle - the coalition lost 34 troops. Saddam International Airport was captured and governmental palaces and offices were taken. On April 9, 2003 Saddam Hussein emerged from his command bunker in northern Baghdad to greet Iraqi supporters. Later that day the city of Baghdad was formally occupied by Coalition forces. Saddam Hussein escaped from Baghdad and went into hiding. 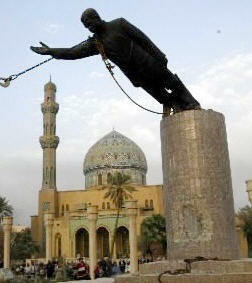 The coalition victory at the Battle of Baghdad was symbolized by the dramatic toppling of a 20ft statue of Saddam Hussein by an U.S. Marine Corps M88 Recovery Vehicle in Firdos Square, Baghdad. Iraq War Facts - 12: On May 1, 2003 President George H Bush announced the official end of combat operations in Iraq. Less than 150 American troops were killed in the allied invasion of Iraq but the aftermath and occupation of the country would claim many thousands more. The following fact sheet continues with facts about Iraq War for kids. Iraq War Facts - 13: Occupation: In April 2003 the second occupation phase of the Iraq war began. US-led forces occupied Iraq and entered the long period of full-scale guerrilla warfare as Iraq descended into the “sectarian violence" of civil war. Iraq War Facts - 14: Occupation: During the weeks and months that followed the invasion and occupation of Iraq, a violent insurgency began to grow against the occupying coalition forces. The insurgents included the Fedayeen Saddam (a paramilitary organization loyal to the Baathist government of Saddam Hussein), Iraqi citizens loyal to Hussein and foreign Islamic fighters. Fighting also broke out between the two Islamic sects in Iraq - the Sunnis and the Shiites - which was tantamount to Civil War. Iraq War Facts - 15: The U.S. military developed a set of playing cards (officially named the "personality identification playing cards") to help troops identify the most-wanted members of President Saddam Hussein's government. Iraq War Facts - 16: In July 2003 Saddam Hussein's sons, Uday and Qusay, were killed in gun battle in Mosul, but their father remained illusive, as the an intense manhunt for the dictator continued. Following a tip-off the American military launched 'Operation Red Dawn' that led to the capture of Iraqi president Saddam Hussein on December 13, 2003. Iraq War Facts - 17: Saddam Hussein was captured in ad-Dawr, a small town in central Iraq about 10 miles south of his hometown of Tikrit. U.S. soldiers found Saddam Hussein hiding in a six-to-eight-foot deep hole, he did not resist and was uninjured during the arrest. Iraq War Facts - 18: Saddam Hussein was taken into custody by United States forces at Camp Cropper in Baghdad. Images of the former president Saddam Hussein, having his mouth inspected and his unkempt hair searched for lice, were televised across the world. Iraq War Facts - 19: The Trial of Saddam Hussein began on December 9, 2003. The former dictator was found guilty of crimes against humanity and sentenced to death by hanging. Iraq War Facts - 20: On January 30, 2005 Iraqis voted in the first democratic parliamentary elections in 50 years. The Shiites and Kurds vote in large numbers, but the Sunnis did not. Fighting between the factions erupt with a surge of violence and civilian deaths toll and the new formation of new Shia led government failed to bring order. Iraq War Facts - 21: On June 8, 2006 : Abu Musab al-Zarqawi, a leader of Al-Qaeda in Iraq, is killed in a U.S. strike north of Baquba. Iraq War Facts - 23: In 2007 ongoing violence by a group calling itself "Al-Qaeda in Iraq", triggered a backlash, known as the Sunni Awakening when nearly 80,000 former Sunni insurgents turn against Al-Qaeda and support the new Iraqi government. Iraq War Facts - 24: Iraq War troop surge of 2007 saw an increase in the number of American troops in order to provide security to Baghdad, where 50% of the fighting took place. There was considerable opposition to this policy in the Bush administration. The US surge focused in protecting the population rather than killing insurgents. Iraq War Facts - 25: In 2007 the Iraqi government called for the withdrawal of U.S. and foreign troops by 2011 and the British began withdrawing their forces from the country..
Iraq War Facts - 26: In February 2009, new elected U.S. President Barack Obama announced that US combat troops would withdraw from Iraq. Although combat duties would cease up to 50,000 troops would remain to help with intelligence-gathering and train Iraqi security forces. Iraq War Facts - 27: The final U.S. combat troops left Iraq on 18 August 2010. In October, 2011 President Barack Obama announced that the remaining American soldiers would leave the country at the end of 2011. Iraq War Facts - 28: The U.S. military formally declared the end of its mission in Iraq in a ceremony in Baghdad on December 15, 2011 as the final U.S. troops prepared to withdraw from the country. Iraq War Facts - 29: The war had lasted for 8 years, 8 months and 28 days during which time 4,487 American soldiers were killed and over 32,000 were wounded. Over 55,000 Iraqi insurgents were killed during the conflict. The death count of Iraqi citizens was in the hundreds of thousands. Nearly 7% of the total population fled the war accounting for over 2 million Iraqi refugees. Iraq War Facts - 30: No weapons of mass destruction were ever found in Iraq. Iraq War Facts - 31: Fighting continues as the terrorist groups known as ISIS and ISIL consolidated its hold over numerous towns and cities in Iraq. Following their takeover of the Iraqi city of Mosul, ISIS and ISIL merged to create a caliphate, renamed as the Islamic State (IS). The article on the Iraq War provides detailed facts and a summary of one of the important events during his presidential term in office. The following George W Bush video will give you additional important facts and dates about the political events experienced by the 43rd American President whose presidency spanned from January 20, 2001 to January 20, 2009.